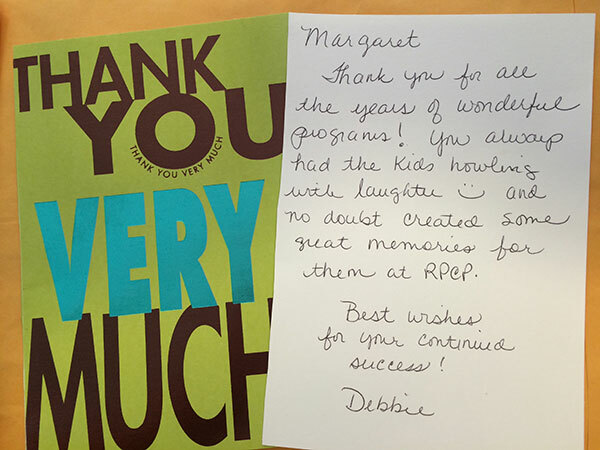 Margaret Clauder Presents Reviews Page - Read what others have shared about an MCP program. Margaret Clauder Presents - Reviews! Did you recently host a program? Please click and share 5 minutes to let us know what you think. What do past clients think of Margaret Clauder? Here are some of the reviews on her shows from people just like you - librarians, directors, and educators. Find out what your peers have said about Margaret! Additional Comments: I have booked Mrs. Clauder for 5 different events where she was 5 different characters. The teachers, students, and administration on my campus absolutely love her. 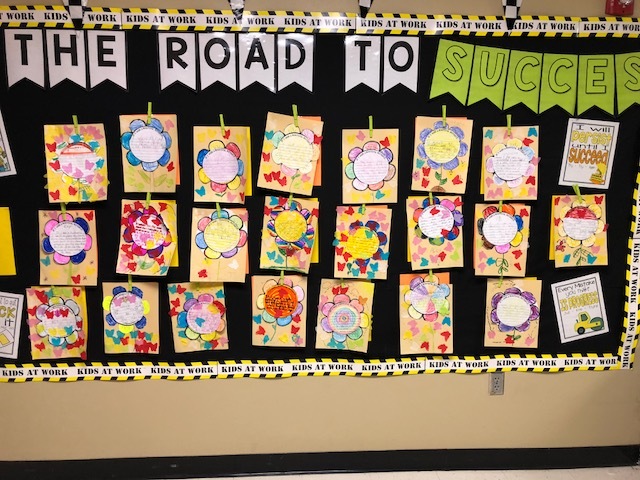 She connects with the students and the teachers. My teachers have asked me time and time again when I will book her next and who she will come as, of course the students are none the wiser that this amazingly talented woman is the same person every time. Margaret is a true professional. Every step of the way she is in contact with you and sends paperwork that is clear and concise and in an timely manner. It's hard for me to pick a favorite character that she's done, but I will say that every time she comes we all absolutely adore her. "Sent you some pictures of the work students did after your Mother Nature program, but message did not attach. Hope you got them. The teachers and the kids could not say enough good things about your presentation. As usual you were fabulous." Margaret tells her own original story "How Calvin the Caterpillar Got His Wings". At the end of the story, tissue paper butterflies magically fly out over the audience (via a confetti cannon). 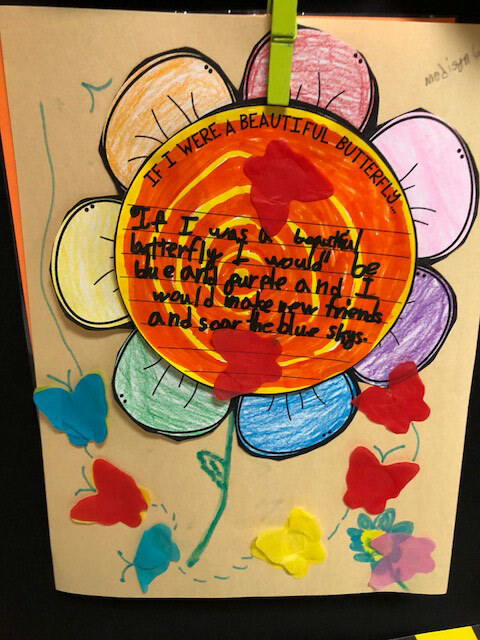 Children pick up all the paper butterflies to use in creating an illustration of the story they hear! "MARGARET CLAUDER ACCEPTED FOR NEW TEXAS COMMISSION ON THE ARTS TEXAS TOURING ROSTER . . ."
"My son who attends Kindergarten at Black attended your 10am show & I was lucky enough to see & photograph it! YOU are amazing! 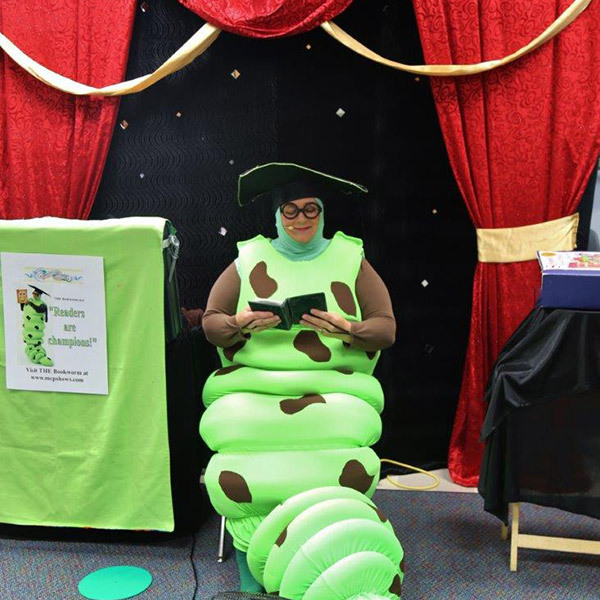 Thank you for sharing your message to encourage young readers in such an enthusiastic way! Blessings to you always!" "Thank you so very much. The children loved you. They have talked about you all week. One little child asked if I could call you right then in the library and have you return to see us.. Thank you for a wonderful day at SMA! We loved having you tell us stories. Great job. Thank you!" 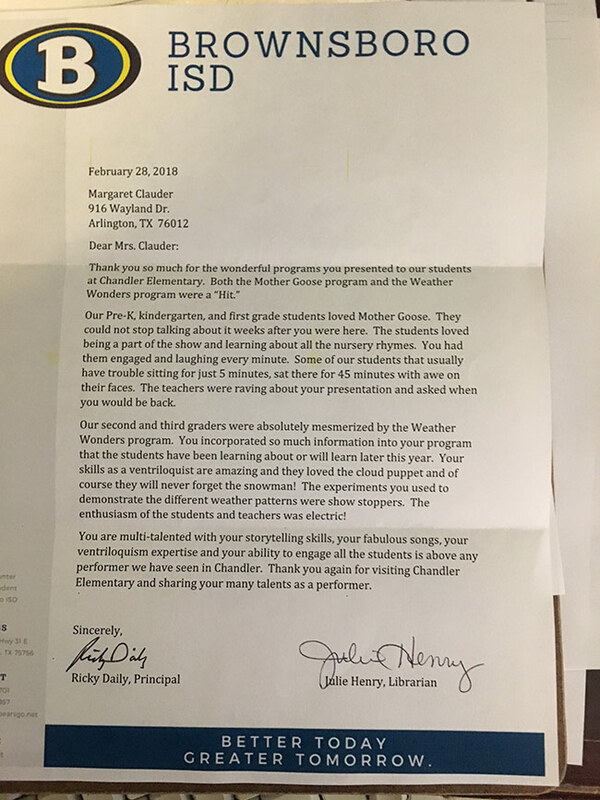 "Margaret Clauder has performed at 3 other Dallas Public Libraries, including Mountain Creek Library, Hampton- Illinois, and Polk- Wisdom Branch Libraries, where I worked as Children's Librarian. In addition, I have seen Margaret Perform at Showcases sponsored by the Dallas Public Library and the Office of Cultural Affairs in the past! She always provides an excellent educational program for Library Children and their families!" "We loved having you! I've heard lots of positive comments from kids and teachers and they thoroughly enjoyed your show! Thanks for coming!!" "Margaret, Thank you again for visiting our campus today. I've heard so much positive feedback from teachers and students alike. Students were engaged and learning. What more can we ask for? I look forward to scheduling you to come see us again next school year." 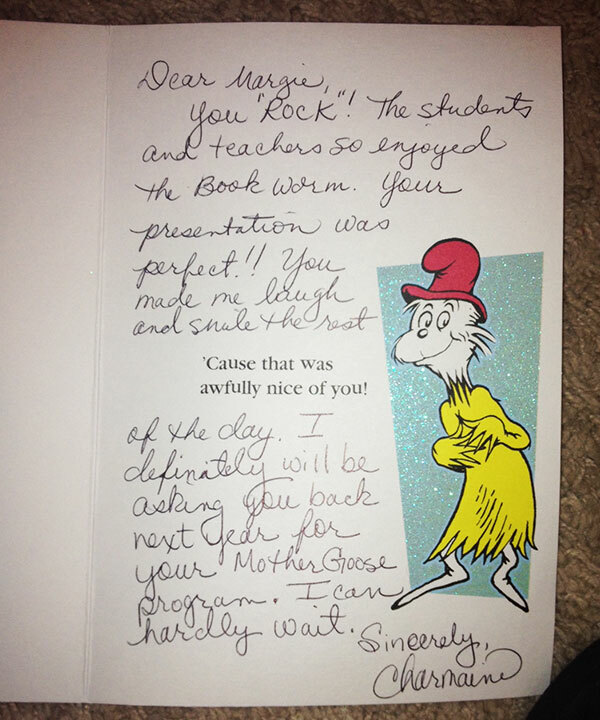 What does a veteran librarian think about Margaret's Mother Goose half-day program? "Thanks for such a wonderful performance at Range Elementary on Friday. The teachers have been raving about you. They say you are the best author/performer I have ever had here.They also say their students are rhyming better than ever. They really get it! You made the Spotlight story on our MISD website! I will definitely be in touch with you for future programs!" I first want to say thank you for coming out to our school and allowing my students to hear from the Bookworm. I have one student in my class that told the class that reading is boring and he hates to read, just this week. So, the class and I made a goal that by the end of the year, he would LOVE reading books! Well after your performance today, this student, who never has any personal contact with anyone, hugged me and said, “I think I like Books”. Thank you for being such an awesome role model for reading." Wow! What a performance you put on for our kinder friends! We all loved it so much, we wanted you to stay all day to keep us entertained! The kids still cannot stop talking about you!!!!!! Thank you for sending me all this information. I have forward it to my team and the first grade team, as well as our principals. We have already started to spread the word about you through FISD. Hopefully you will hear from more Frisco schools! They are missing out!!! We can’t wait to see you next year!!!! Thanks again for everything!!!! You are fabulous and very talented!!!" The kindergarten and 1st grade teachers are raving about how much they and the students enjoyed the program! Thank you so much for such a wonderful program for our students!" "Thank you so much for making our Founder's Day a thrilling experience for both the young and more seasoned in our audience. Your multi-talented entertainment of storytelling, songs, ventriloquism, and puppets with a strong emphasis on reading was enjoyed by all. Also, thank you for going above and beyond by riding in our parade. Mother Goose rocks!" "Thank you so much for letting us participate in Target Tellebration this year. Our guest was Margaret Clauder, the Book Worm. She was awesome. The 351 students that had the privilege of listening and seeing her presentation were fully engaged. They enjoyed her enthusiasm and energy. It was a positive, educational experience." Explain: Students are still talking about your visit. All of our Mother Goose (books) went out very quickly. Also a number of rhyming books did too. Explain: Children were delighted. They were in awe of the performer, wanting celebrity photos with her after the program. Timing was impeccable. I took many photos of kids’ expressions of wide-eyed enthusiasm. Teachers felt the performer must be a television personality, and some very experienced teachers said she was one of the best they had ever seen. Comments: It was fantastic and just right for kinder students. As a teacher I also enjoyed your humor. You kept the kids busy, thinking and engaged. Explain: Reviewed Mother Goose rhymes; focused on hearing and making rhyming words; using appropriate manners; extended thinking with changing the rhymes; increased vocabulary. "The show was great and educational. Very appropriate for Kindergarteners and they loved it!" I filled out the evaluation and I could drop it by your house, but I think you may be at TLA. So, I just marked Excellent on all counts and Yes where that applies. Yes, you may use our school as a reference. We enjoyed your visit. Thank you for coming. 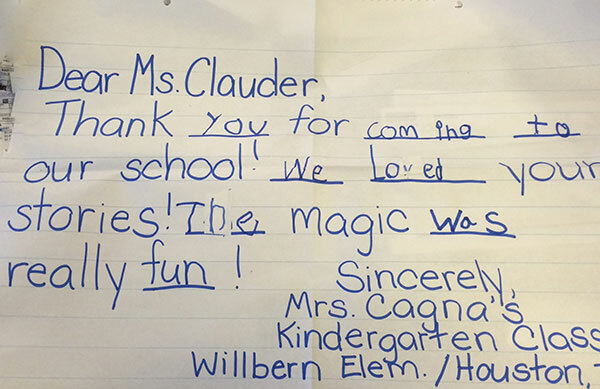 The shows you put on at our school were nothing short of magical to our children. To watch the kids with their wide-eyed imaginations and glowing smiles listen and talk to Mother Goose and all her characters so intently was very touching to me. I even overheard some of the children at lunch discussing where StoryBook Land is and how they were going to go visit. I know our first graders will be wearing their imagination hats for some time. The bilingual show with Senorita Margarita was so enjoyable and culturally educational. It was so entertaining to see how hard the children, especially in the ESL classes, laughed. I learned a lot from the show as well! Your shows were so entertaining and had a wonderful message. With your caring, passion, and talent I know you made some wonderful school memories for our children. Thank you for sharing your talents with the Summer Reading Club members of Lancaster Veterans Memorial Library in June 2004. The library patrons who attended your performances were most impressed with your skills. Thank you for being a part of the Frisco Public Library's Summer Reading Program 2005. Our patrons, both the young and the young at heart, thoroughly enjoyed the ventures with imagination, stories, songs and "friends". And everyone got a kick out of "Rock 'n Roll" Mother Goose - 21st century style! Your show was definitely a favorite! Thank you for helping to make Frisco's Summer Reading Program a success! What was the children's reaction to the show? "Excellent. Everyone loved this show!" What was the children's reaction to the show? Excellent. Sneezy was a Huge hit - all the children had a wonderful time, adults also! . . .Would you recommend this show to others? Yes. Margaret has a great personality. All characters had their own personalities. Absolutely marvelous!" These are a few of the reviews from Margaret's shows. There are many, many more, and every time she performs, there are more people telling their friends how wonderful the show was. Some people emphasize the educational aspects; others note how well she kept the audience focused; still others talk about how much fun they had. No matter what they remember the most, Margaret's audiences remember the show. When you want a performer who is reliable, a performer who educates while entertaining, and when you want a show your patrons and students will be glad you arranged, call Margaret Clauder - (817) 980-1760. She works extra hard to make you look extra good!